This week, dear reader I bring you news of a pair of bolts that arrived at Puzzling Times HQ recently. 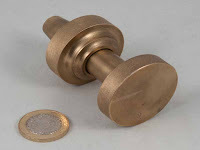 The first is a large, handsome brass beast to add to my little selection of Gillen bolts – Gillen Bolt #2 came courtesy of a friend wishing to unburden himself of a few of his puzzles – it would have been really rude not to help him slim down his collection a little. Bolt #2 looks and feels like the others in the series – it’s a big chunky brass thing that looks ostensibly like a heavy duty bolt… only a lot prettier! 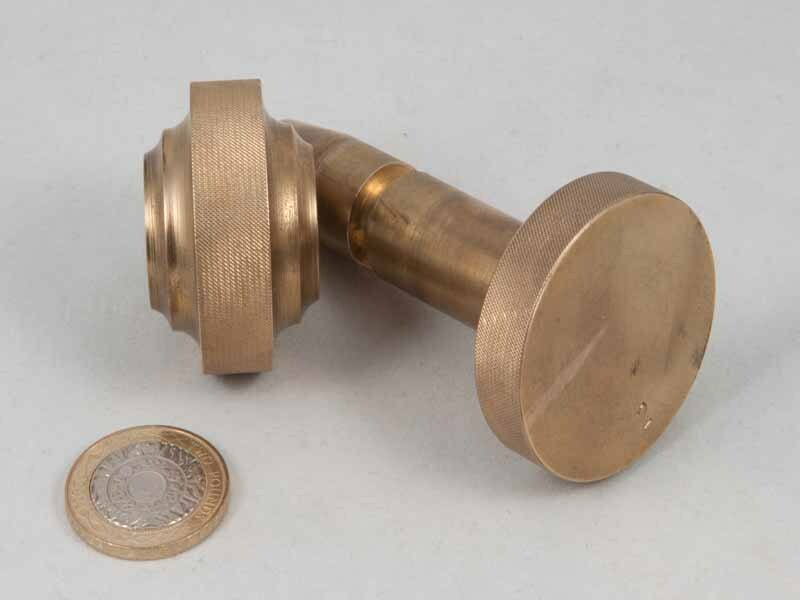 The only thing distinguishing it at first glance from the others is the number 2 stamped on its base. 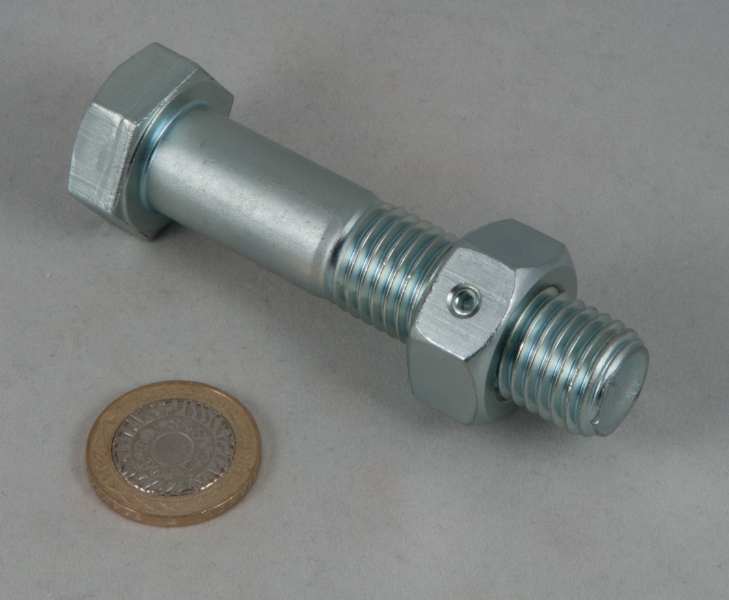 …and in some respects it isn’t – it uses a pair of tricks to keep the nut attached to the shaft of the bolt… and in spite of its relatively lowly number, it will keep an unwitting puzzlist at bay for quite a while. 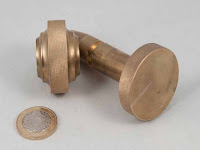 I’ve dubbed the second bolt in today’s little bloglet the Morris Bolt (#1?) – I first saw a picture of this puzzle on FaceBook where it seemed that my mate Ali had designed a new puzzle in the shape of a bolt … at that point Oli had seen it and pronounced it good and the lads were saying that they hadn’t seen any other bolt puzzle like it out there… which really raised my interest levels – as if they needed that at all! 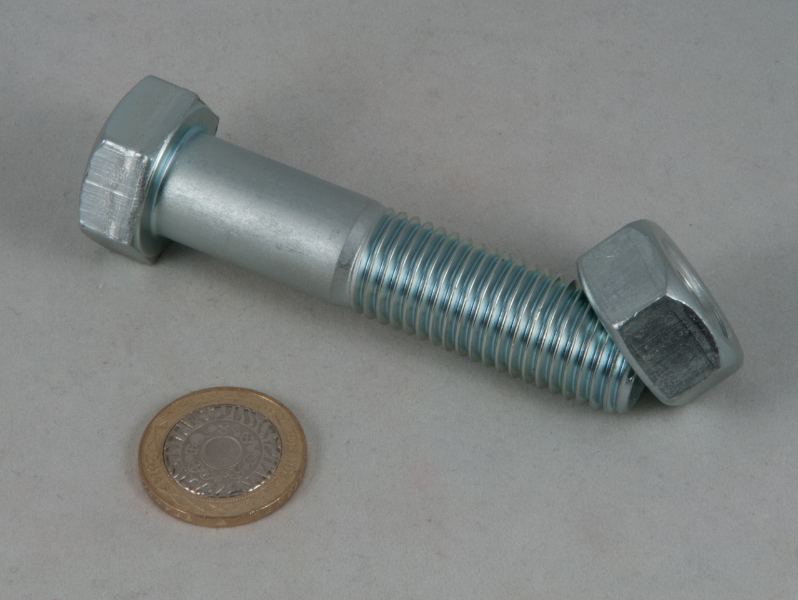 This is a rather large medium carbon steel bolt (according to Google and the markings on it) that stands 10cm tall – it’s a serious piece of hardware! 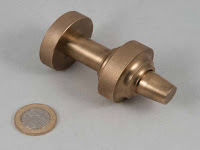 One of Ali’s mates helped him out with some of the machining and apparently he wasn’t quite satisfied with them – all I can say is that he really should be – the work on these things is fantastic – the secret-y bits are very secret-y – you aren’t going to stumble across anything by accident on these puzzles… and you are guaranteed a “How the heck? !” moment when you solve it… absolutely brilliant Ali! One of the col things about being a member of the Karakuri Club (apart from the Christmas presents!) is that you get notified of all of their new offerings and often their newest puzzles are only available to Club members. 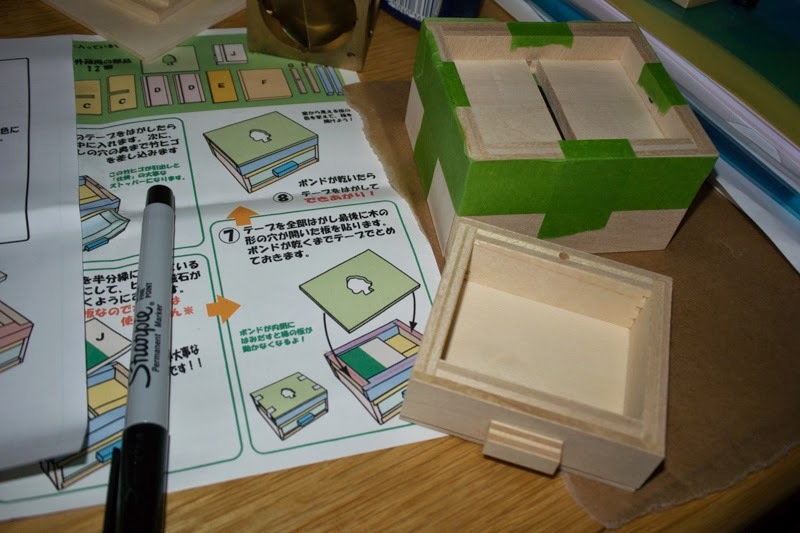 Recently I picked up a couple of rather neat new boxes from them…and a one of their work kits that I’ve been meaning to try out for absolute ages (although that came via Satomi at CU-Japan). It looks pretty plain, if rather neatly finished off on the outside – the rounded edges give it a nice feel with the two halves in contrasting woods giving you a very clear steer toward how the box is likely to come apart – either that, or a very strong piece of misdirection! 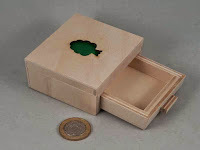 Early experimentation with the box didn’t yield much at all, in fact it’s all rather securely locked up until you try something a bit unusual, and a bit bold, and soon enough you find the first of two compartments…finding the second is a bit more tricky and as with quite a few of these puzzles, if you didn’t know there was another, you might completely overlook the existence of a second compartment […and that’s why I put a couple of Japanese coins in the second compartment…]. Once you do find it, you’ll enjoy how opening each of the compartments is linked – yet so easy to overlook. 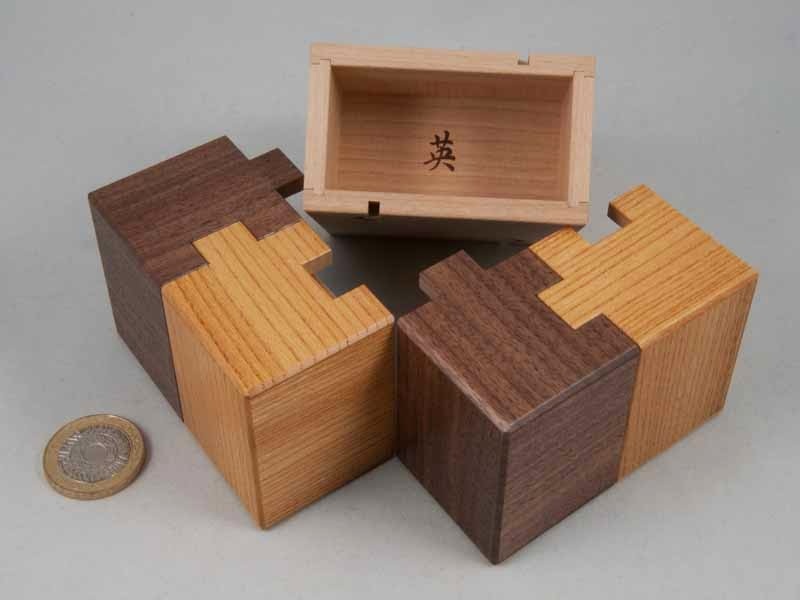 It’s quite an unusual Japanese puzzle box, not overly complicated but reasonably satisfying. 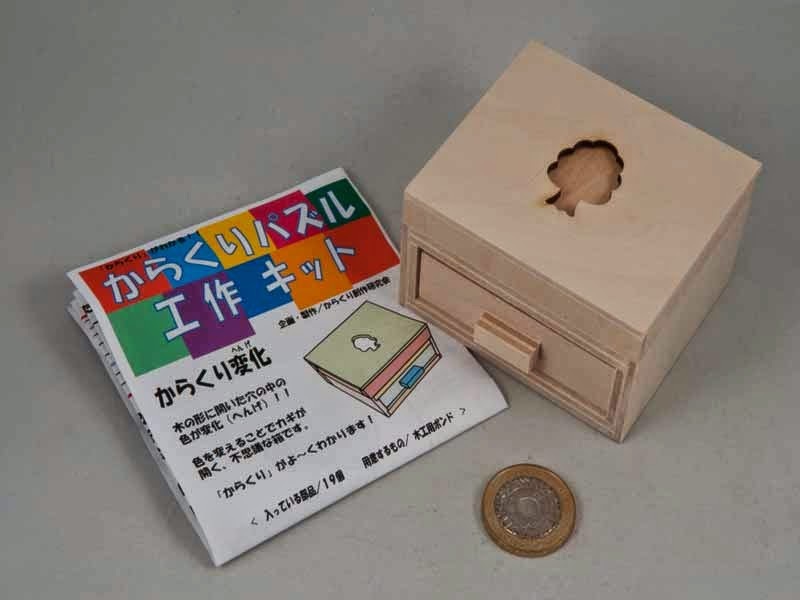 Next up is the latest offering from Hideaki Kawashima, enigmatically titled Half (J) – I’m afraid I haven’t worked out the significance of the name yet. This one appears to be made up of four interlocking puzzle pieces in contrasting colours – with no obvious way for them to come apart. A little experimentation will generally result in a rather magical movement beginning – and once it does, it dawns on you that that would have been the only way that things could have moved without contradicting one of Zeno’s paradoxes, or Pauli’s Exclusion Principle, depending on what you read. I just loved that motion and really enjoyed the second part of it… which then reveals the two compartments, right where you’d expect them to be. 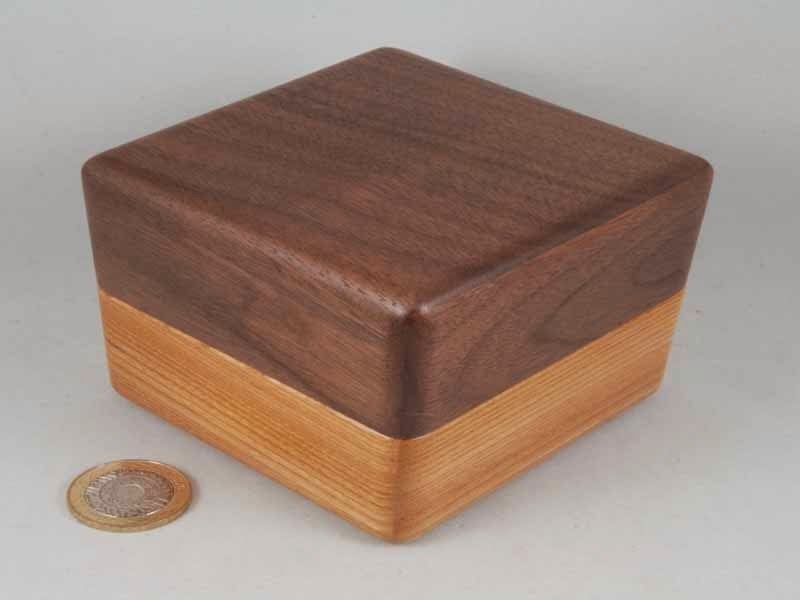 As far as move counts go, this box is probably about as low as you can get, but the movement is really delightful and surprising, to the extent that I’ve found myself randomly reaching for it on the desk and working it backwards and forwards just to put a smile on my face – it works every time! 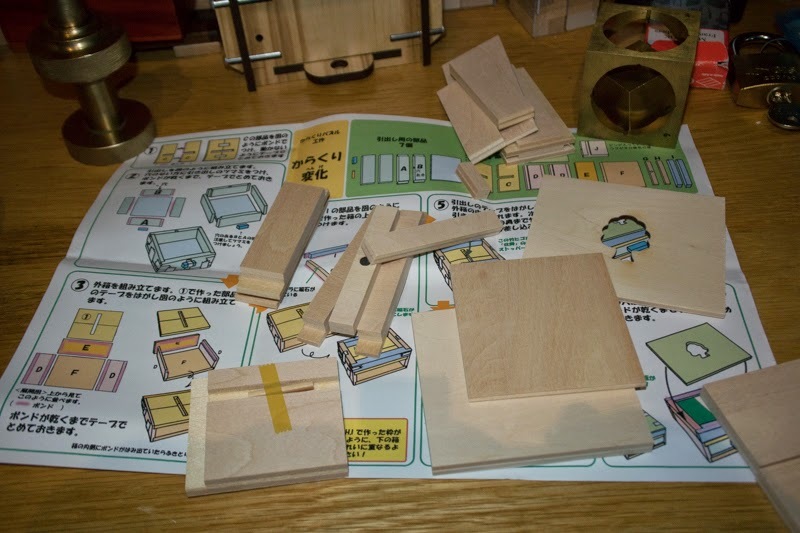 A couple of my puzzling mates have tried the Karakuri kits and enjoyed putting them together so I reckoned it was about time that I joined their ranks… I ordered one from Satomi and the little bag of wooden bits duly arrived along with a wonderfully detailed set of instructions – in Japanese. Now I realise this will come as a surprise, but I’m not fluent in Japanese – and I certainly cannot read Kanji (or any other form of Japanese script for that matter!). Have no fear, the instructions come with some wonderfully explicit diagrams – that show all the details perfectly, including where to put the glue so that you don’t gum up the internals… while I might be missing some of the nuances of the instructions, you can definitely make do with just the pictures! I cleared a small spot on the desk over the weekend and set about assembling the little guy – the instructions really are wonderfully clear (even without understanding the text!). 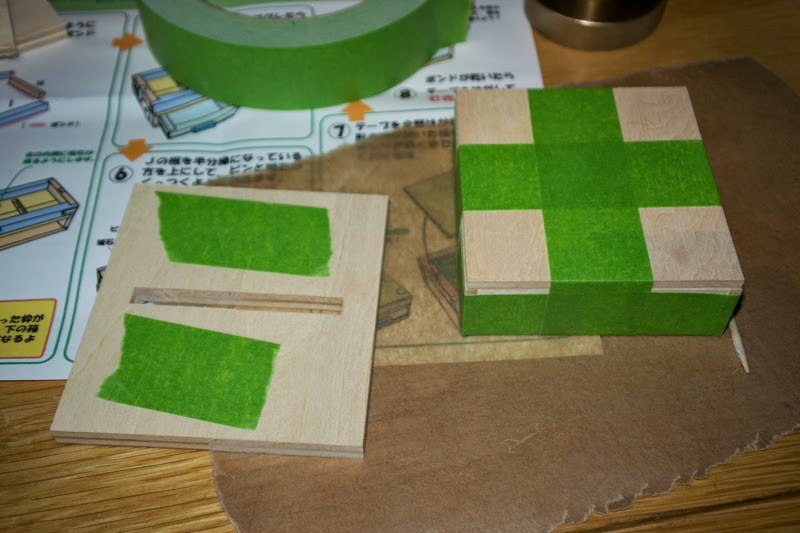 The pieces are all perfectly cut and notched so they go together really easily and a bit of masking tape holds things together rather effectively. I attacked it in a few spurts, assembling various bits and taping them up before going back to my current second job, aka The Book. A few hours between each sub-assembly allows the glue to dry properly before adding the next layer and repeating the whole cycle. 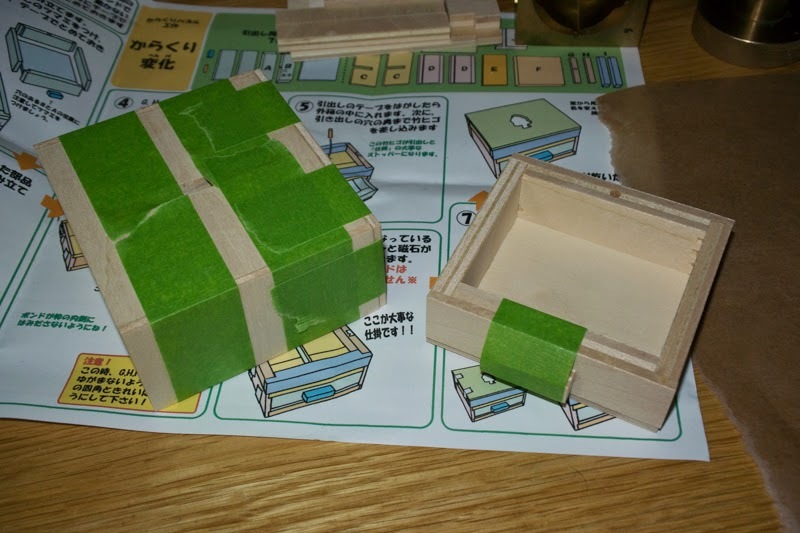 A couple of minutes with a bit of sandpaper removed any extraneous traces of glue along the way, but apart from that, the kit literally just needs gluing together… the Karakuri guys have done all the hard work for you getting the bits all cut perfectly to size. 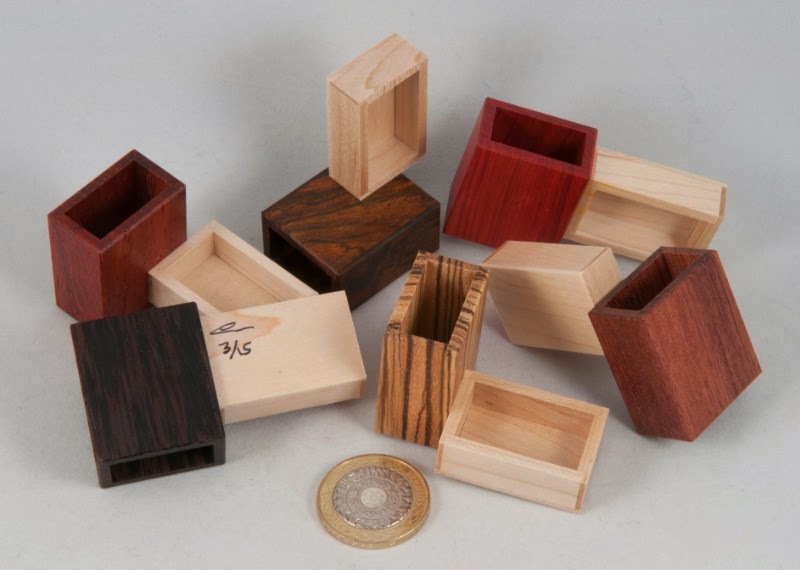 If you are thinking of having a go at one of their kits, go for it – the pieces are all spot-on and the design is pretty much self-jigging so you’ll end up with a box that works, even if you have a few too many left thumbs. There have been a few other rather unusual and intriguing offerings that don’t look like poultry, take Tom Jolly’s Bundle of Sticks for instance… made to look like a – you guessed it – bundle of sticks. 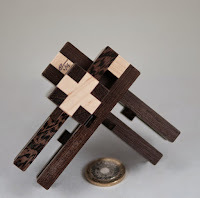 This assembly / disassembly puzzle consists of four sticks with some rather well-placed protrusions (thorns perhaps?) that interfere with the ring that holds the bundle together. When you start this puzzle those thorns are arranged in a neat semi-symmetrical pattern around the sticks with the ring smack bang in the centre. Removing the first piece is not a challenge – it’s a key-piece and simply slides out under the force of gravity… removing the next piece is far more interesting! That takes 13 moves… and even removing the second last piece takes another six moves. With the simple ring around the centre all of the pieces are pretty much in view all of the time, so you can plan a route to get things out of the way. 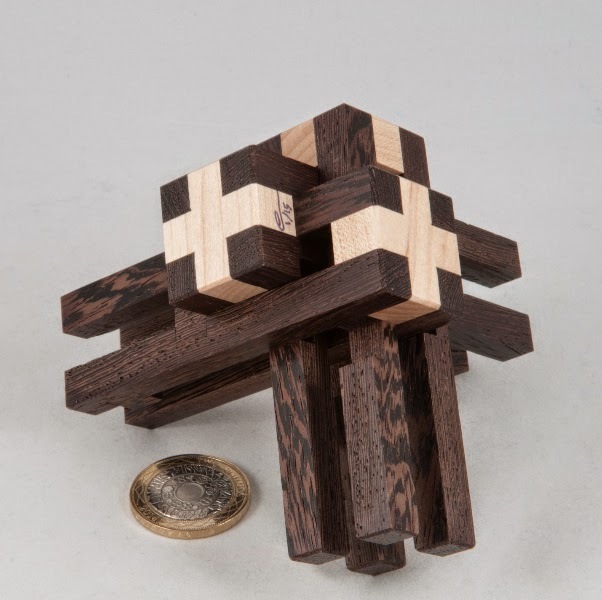 A couple of the pieces have caps on their ends which cuts down on the possibilities for movement in a few of the orientations, but even still, working out how to align the pieces in order to make progress isn’t a horrible challenge in spite of the puzzle’s level. Next up is a variant on a puzzle that has a lot to do with why I really enjoy collecting mechanical puzzles: Matchbox Play Six is a variant of Oskar’s Matchboxes – the topic of my 6th blog post (this by contrast will be my 377th post...) and one of the puzzles I blame for my thoroughly irrational love of beautifully handcrafted puzzles. 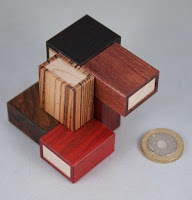 While Oskar’s design has 5 interlocking matchboxes and can be a fairly tricky puzzle, Olexandre Kapkan’s version has six matchboxes that separate naturally into three mirrored pairs. Eric’s created them in a bunch of different exotic woods and calling it a beautiful puzzle does not do it justice. It is gorgeous! 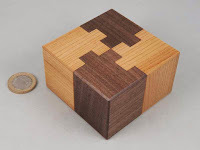 It is great fun to experiment with and even muggins has managed to find a few solutions on this variant – from pretty compact to a big loop – a very cute variant on a classic Oskar puzzle… and it looks brilliant next to the original version! 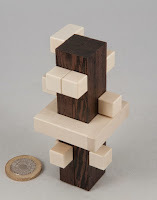 Last puzzle for today is Uri Three Bars designed by Dario Uri. 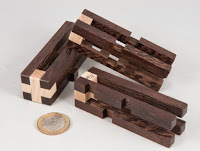 Eric’s made these with wenge legs and maple caps – a nice contrast. 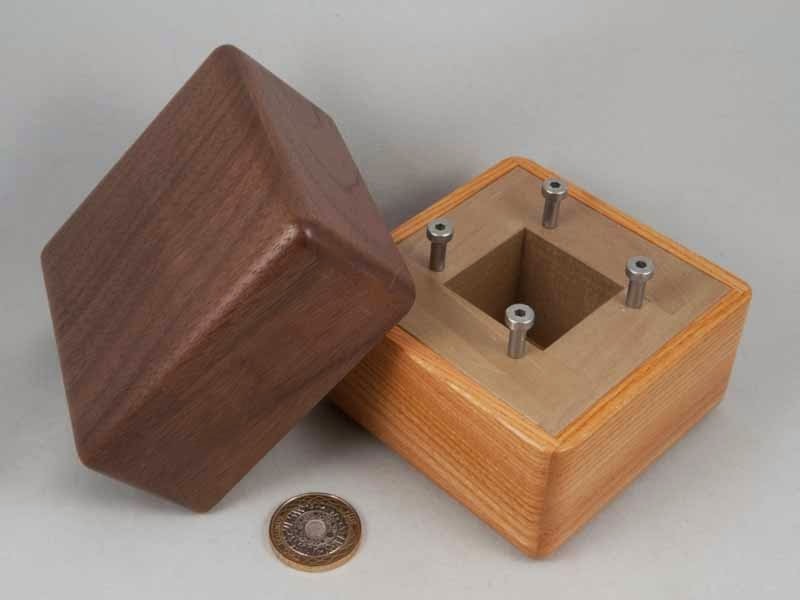 The object is to intertwine the three pieces so that they meet with the three caps all together…which would be simple if there weren’t bumps and grooves on the legs along the way. Those bumps and grooves mean that sliding any pair together so that the caps meet is reasonably easy with a little manoeuvring – but introducing the third piece requires some backtracking … if you’ve chosen the right two to start with… if you haven’t, no amount of manoeuvring will help you. Eric shipped these puzzles disassembled, probably just to avoid damage, not to make it harder for puzzlers. No, I’m sure he didn’t… (nope, I’m not convinced either!). After a little fiddling around I thought about putting the pieces into BurrTools for some, ahem, assistance… only to realise that without know where the bumps and grooves would be on the solved puzzle, I was going to have to use a lot of variable voxels and it might actually end up taking longer than solving it by hand… so I went down the manual route… and delighted myself by solving it without having to spend absolute hours on it. I probably got a little lucky, because finding which two pieces to start with and then when to introduce the third piece (that’s a long way from obvious!) didn’t take too long… and finding the path through to getting all the caps together was a great reward. Having solved it, I put the completed puzzle into BurrTools and lo and behold, there is a unique 11-move solution… and knowing from Eric’s website that it’s a level 10 puzzle, you can deduce that introducing the third piece happens pretty early on in the process!